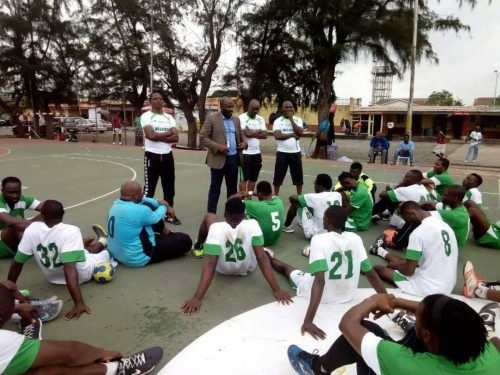 The Nigeria Handball Federation has called up 23 players to camp ahead of the 2018 Africa Nations Cup in Gabon. The players invited are expected to report to camp in Lagos on December 3rd as they intensify preparations under the watchful eyes of coach Michael Taangahar who is to be assisted by Solomon Yola while Segun Tunji is the Goalkeeper trainer. The secretary of the federation, Haruna Muhd Maigidan Sama, said the 23 players invited were picked from the first phase of camping in August. Goalkeepers:- Saka Sallau Saidu (FRCS), Olatunde Adams (Al Shamal Sports Club Doha, Qatar), Michael Solomon Agbaji (Kano Pillars) and Muktari Muhammad (FRSC). Centre back: Chris Ogedegbe Ahmed (Kano Pillars) Abdulmajid Mudashiru (Civil Defence), Abubakar Atabo (FRSC), and Emeka Adigwe (Edo Dynamos). Back left:- Philip Igwe Kalu (Maccabi holon hb Club of Israel), Samora Samuel (Nigerian Army) and Kingsley Okubuike (Kano Pillars). Back right:- Jacob Katau Ayuba (Taraba Ambassadors), Obinna Ani (KMC Sports Club Marrakech, Morocco) and Gbenga kole (Lagos Sea siders). Wing left: Aminu Aliyu (Niger United), Aminu Adamu (Kano Pillars) and Ibitoye Ayomide Martins (Lagos Sea siders). Wing Right: Emmanuel Amadi (FRSC) and Osas Olaye Mathew (Edo Dynamos). A final 16-man list will be selected for a closed camp in Cotonou on January 9, 2018 and will depart Libreville, Gabon on January 15 for the Nations Cup scheduled to take place from January 17-28. Nigeria will feature in Group B alongside Egypt, Angola, Morocco and Congo. While Group A has Tunisia, Algeria, Cameroon, Dr Congo and hosts, Gabon.